The shocking news led to an emotional phone call between a son and his proud mother. It also led Archbishop Joseph W. Tobin to think again of his late father, the man who continues to shape his life and his faith. And the widespread joy surrounding Pope Francis’ selection of Archbishop Tobin as one of 17 new cardinals on Oct. 9 also included an unexpected, fun moment. As the 64-year-old archbishop walked into his Indianapolis gym for a workout less than 24 hours after the pope’s announcement from the Vatican, he was greeted with congratulations and hugs from his fellow weightlifters. All those telling moments were shared during a conversation with The Criterion on Oct. 10. It’s a conversation that captures the special relationship that Cardinal-designate Tobin and Pope Francis have, and the deep connection that has grown between the cardinal-designate and the archdiocese he has led for almost four years. 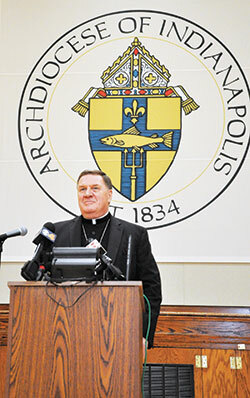 Here is an edited version of that conversation in which the archbishop shares his thoughts on his historic selection as the first cardinal to lead the Archdiocese of Indianapolis. Q. Who was the first person you thought of when Pope Francis named you as a cardinal? Q. Take a look at the 17 new cardinals that Pope Francis has named. Some analysts have suggested that this group reflects the pope’s emphasis on the Church building bridges and being more welcoming. What do you see as a common thread among the 17 new cardinals? A. “I think that there isn’t an internal job description for a cardinal, almost like there isn’t really one for the Holy Father. The Church prays as it elects a pope that he will be the one it needs now. And I’m quite convinced that Pope Francis is the pope we need now. I served closely with Benedict XVI and St. John Paul II, and they all responded to needs that were real in the Church and the world at that time. “In the same way, cardinals are chosen for the needs the Church faces now. And so that’s why his first choice was an Italian who is the ambassador to Syria—which in the decree says, ‘Our beloved and martyred country of Syria,’—so that’s really on the pope’s mind. Q. In your press conference, you talked about the archdiocese being your teacher in the last four years—that it’s helped to form you. When you look at these four years of your life in the archdiocese, leading up to the announcement by Pope Francis, what goes through your mind? A. “The first thing that goes through my mind is gratitude. I’m grateful that Pope Benedict XVI sent me here. I often believe that the Apostle Paul makes reference, in his letters, to the faith of the people he’s writing to. I think that’s not just a courtesy or a literary form. It’s because their faith serves to strengthen his faith. And that’s certainly been my experience here—meeting faith-filled people whose faith and works challenge me and support me. So there’s gratitude. 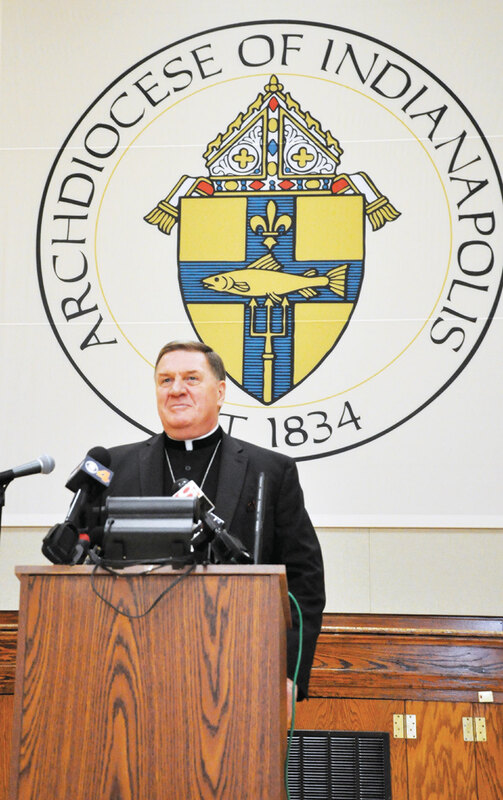 “Secondly, one challenge I’ve articulated a lot recently is the challenge of a far-flung archdiocese—131 parishes in 39 counties, moving from resembling more of an archipelago to a network, a network of solidarity and support. That has demanded some painful decisions, and I know that people still suffer from some of the results of Connected in the Spirit. Q. At the same time, you’ve developed a deep connection with the people of the archdiocese during these four years. How would you describe that connection? Q. You mentioned Pope Francis finishing second in 2005. In 2005, you participated in a synod with him. During that time together, you passed along to him that your mom said, ‘He should have won.’ What does your mom think about him now that he named you a cardinal? Q. You’ve had the opportunity to know Pope Francis since 2005. At a Mass at St. Peter’s Basilica in Vatican City in 2013, you received a pallium from him, symbolizing an archbishop’s role as the shepherd of his archdiocese. In that moment, he spent considerable time talking with you. How would you describe your relationship with him? A. “I really do think, in all sincerity, that I’m an unworthy recipient of his affection. I don’t know why. Whatever began in 2005 has continued and deepened. Q. People see similarities between you and Pope Francis in terms of building bridges and being welcoming to refugees and immigrants. Talk about that connection between the two of you. A. “I think it’s the connection of a teacher and his disciple. When I’ve seen him a handful of times over the last four years, I always thank him for teaching me how to be a bishop—knowing not only how he ministered in the Archdiocese of Buenos Aires, but also what he teaches and how he articulates his expectations for bishops and priests. Q. On Sept. 7 at a Mass for administrators in the archdiocese, you began your homily by asking people, ‘What would you name as the greatest moment of your summer?’ Then you made a connection to your one-on-one meeting with Pope Francis during the summer. I think you’ve already established the greatest moment of this fall. In terms of your life, is this the most memorable moment? A. “That’s a difficult question to answer. I would tend to say no, only because I’m at the distance of 24 hours. Becoming a cardinal, as much as I understand it, is an additional invitation to serve. I don’t see it as much different beyond that. I think there have been other moments in my life as a priest, as a Redemptorist, as a man, as a human being, that would supersede it. Perhaps this is a doorway to other great moments of service. “I was the superior general of the Redemptorists for 12 years. In my final, circular letter to the congregation, I reflected on why God called me to do this work. Q. You mentioned the first 24 hours have been a whirlwind. You had a number of phone calls and tweets. You confirmed young people at St. Paul Parish in Tell City that afternoon. You were hugged by fellow weightlifters when you were at the gym this morning. In the quiet moments when it was just you, what was going through your mind? Did you pray or ask any particular saints for intercession? Q. During this time, have you thought back to when you first became a priest? Q. Do you think at some point you’ll be able to see the joy in this moment, the joy that a lot of other people in the archdiocese are feeling for you? A. “I’m sure of that. When I see my people happy, truly happy, that already is a great joy for me. One of the affirmations of Thomas Merton toward the end of his life has always fascinated me. He was asked, “If you knew then what you know now, would you do it all again?’ He said, ‘Absolutely not. But having done it, I would.’ It’s in the rearview mirror that he saw the grace. And I’ve found that over and over again. “When I reflect on my life, it always leads me to gratitude. I think that’s why, strangely enough, I don’t think that this is a coincidence—that my episcopal motto [“Rejoice in the Lord always. I shall say it again: rejoice!” (Phil 4:4)], and the little saying on the holy card for my ordination as a priest all are from the Letter to the Philippians. It’s a letter that makes a lot of sense to me. It’s an Apostle and his people talking and discovering joy because they belong to Jesus and they’re in Christ Jesus. Q. In terms of that joy, there has been some initial discussion of a local celebration, at some point, of your selection as a cardinal. How much will you be looking forward to sharing this moment with the people of the archdiocese? A. “My priority remains serving Jesus Christ in the people of the Archdiocese of Indianapolis. That’s what has been entrusted to me. Secondly, I want to be able to say thank you to the people for helping make me who I am. Because who I am is why Pope Francis chose me. And thirdly, there’s the firm conviction we can do great things together. And in doing that, it’s going to take us out of ourselves. Q. One of the great influences of your life is your dad. I would imagine your thoughts have turned to him in terms of this appointment. How do you think he would react to this news in terms of the son he hoped to raise, and the example he gave you as a life to follow?